Guitarist Steve Brown has been a busy guy as of late. He’s filled in for Vivian Campbell in Def Leppard while Vivian was going through cancer treatment. 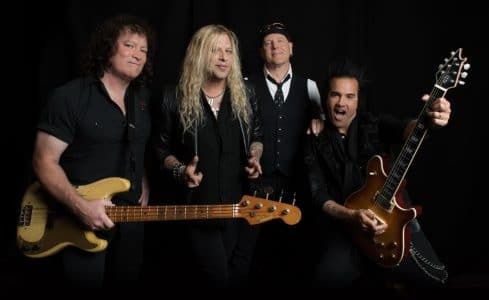 A few weeks ago, Brown sat in with Danger Danger who ironically features Ted Poley, the singer in Tokyo Motor Fist, which are set to release their self-titled debut album via Frontiers Records on February 27th. Brown is of course best known for his work with Trixter and we talked about that and then some. Enjoy and as always; your feedback is welcome. 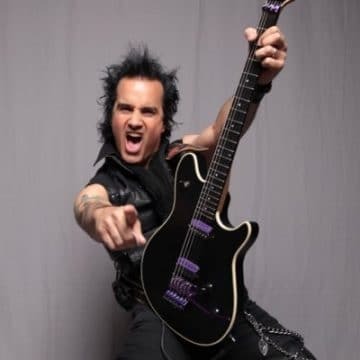 Sleaze Roxx: My first exposure to Trixter was on Much Music when I saw “Give It To Me Good.” Then MTV followed suit and before you knew it, the band was all over MTV. I saw you guys in Portland [Oregon] opening for Scorpions who were touring behind ‘Crazy World’ which was massive for them. That must have been a highlight for you. Steve Brown: Oh man, that was a phenomenal experience. Everything was clicking. I think by that point “One In A Million” was #1 on [Dial] MTV. We were living the life. We were ‘rock stars [laughs].’ I remember we did multiple nights in L.A. because they are huge in California. We got a great opportunity to play several arenas. The Scorpions and their crew treated us so well. I’m so grateful. I learned so much from them from that tour because they are such a well oiled machine. Sleaze Roxx: I remember seeing Trixter was all over Metal Edge magazine, which focused on the hard rock acts of the time. I remember hearing rumors that Trixter was a fabricated band like The Monkees or something. Obviously, in that era, we didn’t have internet and our resources were limited. Steve Brown: [Laughs] Man, that’s the furthest thing from the truth [laughs]! Trixter is a band that I started when I was 12 years old in 1983. We had been playing clubs for years before we got our record deal. We paid our dues, but there were a lot of bitter people that discounted us because of our ages. People were like “Who are these guys?! They’re 18 years old and they have a record deal? !” Then we got regular rotation on MTV and we had a #1 video on MTV, then we toured with Poison, then Scorpions. We were definitely not a ‘fabricated’ band in any way, shape or form. Sleaze Roxx: Another thing that was floating out there about Trixter is that you guys were in your mid-20s but were claiming to be 18. Steve Brown: I think people didn’t think kids could play instruments? I think that comes with the territory when you put yourself out there like that you know? I found that people that don’t want you to succeed will got out of their way to say whatever it takes to bring you down. Sleaze Roxx: Trixter had a song on a soundtrack. The song was “One Mo’ Time” and you got Edgar Winter to play on the track. How did that come about? Steve Brown: Our record label [MCA] was working on a soundtrack for a film called ‘If Looks Could Kill’ which starred Richard Grieco. The label approached our management and said they needed another song. They didn’t want something that was ‘too hard rock.’ We were in the studio working on the song and I had a friend in the studio with us at the time. He said we should get Edgar Winter to play on the track. He happened to know him and sure enough he said “yes” and next thing we know, he’s in the studio with us. He was such a nice guy and we learned a lot from him in a short time. He’s a legend and every bit of a sweetheart. He played an amazing sax solo on that song. Sleaze Roxx: Steve, you were also part of a Van Halen tribute act. Was that something you put together or was it already in place when you came into the picture? Steve Brown: It was already established. I played in a Van Halen tribute band with Ricky McCoy who played in Fan Halen and The Atomic Punks for a little bit. I really think that Ricky is just as good as Ralph Saenz or is it Michael Starr? Anyway, Ricky called me up to see if I wanted to do the gig and Van Halen is my favorite band in the world so why not? We played a lot of really cool shows and it was such a blast doing it. Sleaze Roxx: So how did the [Def] Leppard gig come about? Does the phone ring and they ask you to audition? Steve Brown: Not at all. Those guys are like family to me. Most people don’t know this but I go back with Def Leppard to about 1988 when they were touring behind ‘Hysteria.’ Phil Collen is a like a brother to me. 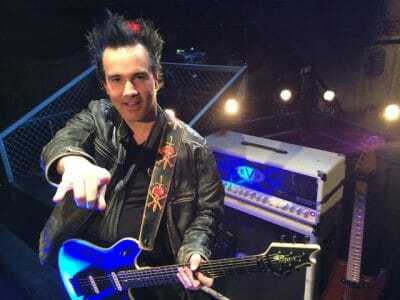 When Vivian [Campbell] was diagnosed with cancer in 2013, Phil said to the Leppard guys, “I have the guy that can step in while Viv is undergoing treatment. Let’s call Steve.” I was also friends with Joe [Elliott] and I think it helped that he was a fan of one of my other band 50 Ft Ringo. I think he knew I had the voice to do it. I truly believe that I got the gig not because of my ability as a guitarist but more because of my vocal ability. So I got the call in early 2013. I learned the entire set and fine tuned my parts and began playing some gigs with them in 2014. 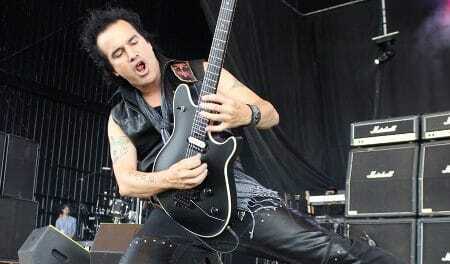 Sleaze Roxx: What was the most difficult song to learn for you? Steve Brown: I will say this; the Def Leppard catalog is not the easiest thing to learn. There’s some very intricate guitar parts, very unique guitar parts. Steve Clark wrote things in shapes and boxes that I haven’t played before. So it was challenging for sure. I have said this to friends of mine that are guitarists, “Man, the Leppard gig isn’t as easy as you think it is.” It was a challenge to dig in and learn the Mutt Lange/Def Leppard collection. They are not your typical ‘cookie cutter’ rock and roll band. They have an unique way of writing songs. Sleaze Roxx: And most recently you performed on The Monsters of Rock Cruise with Danger Danger. Steve Brown: I did. In fact, I played a couple of gigs with them last year. Let’s just say that I will probably wind up doing a lot more with them in the future. Sleaze Roxx: So that tells me that you’re going to be a permanent fixture in the band? Steve Brown: [Pauses] Well, we’ll see how it goes but they know I’m willing to do it. I love that band and Bruno [Ravel], Steve [West] and Ted [Poley] are like brothers to me. Sleaze Roxx: Danger Danger is an incredibly underrated band. Steve Brown: I agree. Much like [Def] Leppard, their songs are trickier than you think they are. It was a blast studying the Danger Danger set because it’s some incredible melodic hard rock. Sleaze Roxx: Which leads us to Tokyo Motor Fist which also features Ted [Poley]. It’s a Frontiers Records release. Frontiers has a tendency to put together a group of musicians. Sometimes it works wonderfully, other times not so much. Was this something you were approached about or did Tokyo Motor Fist predate Frontiers getting involved? Steve Brown: It was Serafino [Perugino] at Frontiers that approached me about the possibility of making a record with Ted. I thought about it for about ten seconds and said “sure.” He then asked who else we should get in the band and I immediately thought we have to get Greg Smith [bass] and Chuck Burgi [drums]. Greg and Chuck played in Rainbow together years ago and they’re a perfect fit for this band. We’ve been friends for so long that it was a smooth collaboration. We had a blast making this record and I do believe you can hear it on the record. 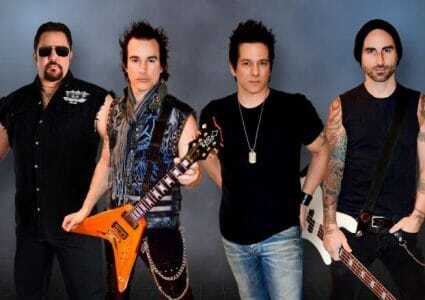 Sleaze Roxx: What’s the story behind the name? I mean you’re all [New] Jersey guys, right? Why not Jersey Motor Fist? Steve Brown: That would have been too obvious [laughs]! I actually have a notebook where I keep ideas, names of bands, album titles, and lyrics. I actually had the name 50 Ft. Ringo for a while before I used it. So that’s where the name originated. I had it in the notebook and I decided to use it. 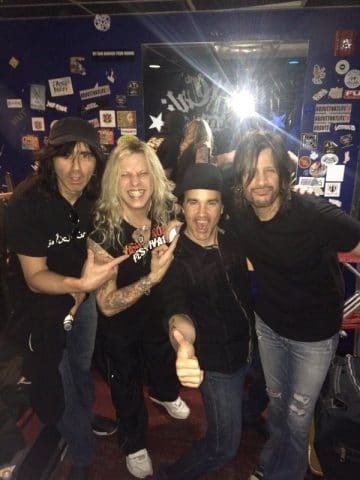 Sleaze Roxx: So I imagine Frontiers wanted a classic hard rock sound for Tokyo Motor Fist? Steve Brown: Oh yeah, they didn’t want us to reinvent the wheel. They wanted the Trixter sound mixed with Danger Danger along with Def Leppard, classic Bon Jovi and Van Halen. It’s stuff that you’d expect from us. There’s more depth to us. There’s stuff that is heavier and we have our own identity. There’s stuff on here that you’ll hear Ted sing in a style that you’ve never heard before and I’m excited for people to hear that. Subscribe To Be Alerted When We Add New Videos – http://radi.al/SubscribeFrontiers From the album TOKYO MOTOR FIST. Sleaze Roxx: You remember the first idol that you met? Next after that it was meeting Eddie Van Halen at the NAMM in ’91. I got to spend some time with him. We became fast friends. In ‘92, we were making the second Trixter record [‘Hear’] and I got invited to his Malibu house where I got to play volleyball with him and drink beer [laughs]! It’s unbelievable and we’ve had a lot of great times together.